I spotted a very interesting thread, at least for me personally, at the Google Webmaster Help forums. The thread has one webmaster who is upset that although his video sitemap file is being shown to have been recognized without error the videos are not showing up in a site command at Google Video Search. Googler, Paul Carff, suggested the reason was because the video was too low on the page. Paul said, "You might try moving the location of the video on the page. When I look at your pages the video is off to the bottom some - not great placement. Could you move the video up on the page - that might help." Why is this interesting to me? Well, I have the same issue. I have my video box placed on the bottom right section of this site but it just links to the blog post, which has the video embedded via YouTube and a raw link to the video file used for iTunes and the Sitemap file. Moving the video higher would help? I submit my videos via a video sitemap file and even though they show up fine in Google Webmaster Tools, they do not show up in the site command on Google Video. The sitemap file has the latest 10 videos and shows no errors in Google Webmaster Tools. 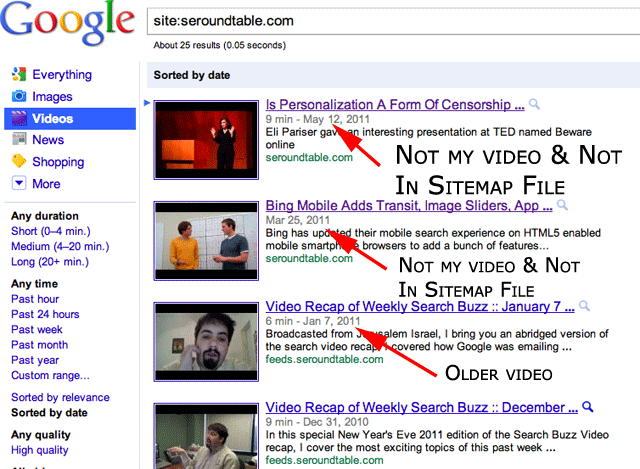 Now look at the Google Video results sorted by date for a site command. These are all older videos, plus some of these are not even hosted on my domain, just embedded from a 3rd party source. So either the most recent date function is not working or my videos are not coming up in Google Video? Even searching for the sitemaps title of a video doesn't return last week's video.